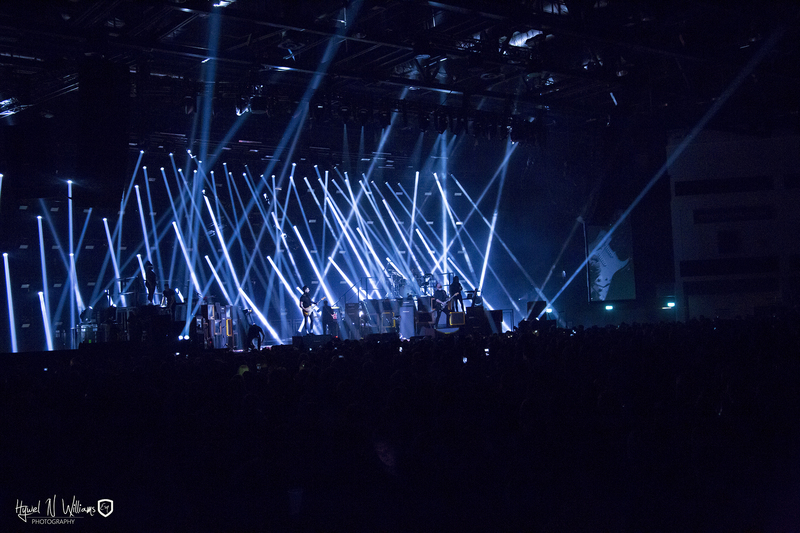 LONDON—Lighting Designer Michael Straun recently deployed a full array of Martin by HARMAN fixtures to create an exciting and dynamic lighting design to support James Arthur’s UK headlining “Back From the Edge” arena tour. James Arthur is a rising artist in the UK music industry, scoring numerous chart-toppers and awards since winning the ninth season of “The X Factor” in 2012. In support of his new album “Back From The Edge,” Arthur recently embarked on his first ever UK arena tour. Tour Manager JP Firmin and Creative Director Meggan McKenzie from UK creative production company The Live Dept. hired Straun to join their team, and together created a fresh and exciting lighting design for the tour. Straun partnered with McKenzie, tour Lighting Director Dan Williams and lighting supplier Christie Lites to create a dynamic visual experience for the tour, powered by a robust selection of Martin fixtures. McKenzie’s set design eschews traditional video walls, instead featuring vintage television sets and arcade cabinets that are integrated with the band’s backline. The back wall of the set features an arched soft ladder wall of lights made up of 80 strobes, lasers and MAC Axiom Hybrid fixtures. In addition, Straun deployed an impressive Martin-based lighting rig to engage arena audiences, including MAC Viper Performance, MAC Viper AirFX, MAC Axiom Hybrid and Atomic 3000 LED fixtures. Straun’s main objective was to support each performance with a dynamic lighting display that could evolve over the course of the evening. When designing the system, he wanted to minimize the time needed for load-in and deployment, while delivering the power and flexibility of an arena-sized rig. The versatility of Martin fixtures allowed Straun to create an impactful show that is both dynamic and fresh with a modest number of instruments. For key lighting, MAC Viper Performance enables Straun to provide focused spots on Arthur and his band, without washing out the entire stage. Straun also included MAC Viper AirFX on the main trusses to offer a combination of hard-edge, mid-air effects and powerful washes. To enhance the stage’s backdrop, MAC Axiom Hybrids were suspended from vertical ladders behind the stage, alternatively providing beam, spot and lush textures. Photos by Hywel N Williams Esq Photography, https://www.facebook.com/HywelNWilliams/.